Storage Buildings 8' x 12' through 16' x 40. Cabins 8' x 12' through 16' x 40. We offer rent-to-own option on all the above! We have several concrete contractors that we can put you in touch with if you need a concrete pad for carport, enclosed garage or metal building. If you cannot come to Fort Valley, I can send you a brochure or whatever information you need via mail or email and take an order over the phone. Call or email me with any questions or if I can help you with anything. 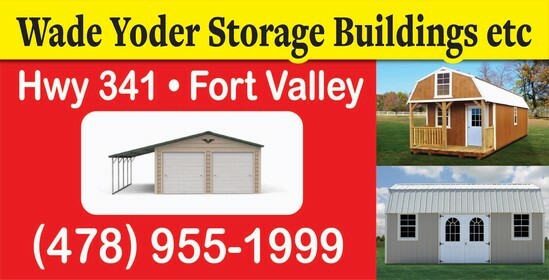 I use our Facebook page to show some of the storage building deals and repos on the lot here in Fort Valley, GA and to feature some of the cabins that are on the lot and how some of our customers have customized them into living spaces etc.